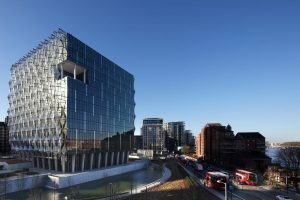 The new American Embassy in London is located across from the Thames waterfront and includes a publicly accessible park that disguises a variety of security measures. LONDON — The new American embassy designed by Philadelphia’s KieranTimberlake is built to take virtually anything that terrorists could throw at it. Its elegant concrete perimeter walls are hardened to stop an explosive-laden truck. Pits hidden in the lush native plantings are designed to trap suicide bombers before they get near the building. Even the regular infusions of fresh air pumped into the building are screened against poison gas. But just as employees were beginning to move in last month, the embassy was subjected to an assault from a source they never expected: the president of the United States. Taking to Twitter, President Trump ridiculed the decision to move operations from the old embassy in London’s posh Mayfair section to an up-and-coming neighborhood on the Thames River. After inaccurately blaming the Obama administration for the move, Trump leveled the ultimate developer takedown: The sale of the old embassy was “a bad deal” for America.